Thousands of species exist in our world. Creatures Big and Small. But increasingly, more and more species move towards extinction because of human induced changes on the environment. These can be indirectly through destroying habitats as we seek more land for residential use, to build houses to live on or to farm to add to our food security and directly through hunting, overfishing, dumping of toxic waste on the environment and through negligence in one word. All species are important in the wild to balance the ecosystem and to complete the chain of life. For this to happen their habitats need to remain intact and we as humans need to practice sustainable behaviour. Endangered Species are plants or animals that are very much at risk of being lost forever from the world. This is in most cases due to human interference which has caused an imbalance that the species fail to adapt to. There are many species that are endangered as per the International Union for Conservation grading scale. We have a number of species classified in each category of the Red list of endangered species. 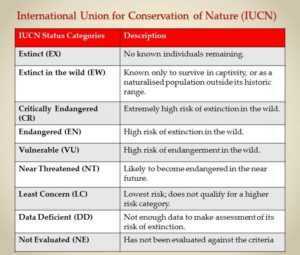 One thing to note is that even species that fall in the “of least concern” category are also at risk depending on the human activities now and in future. Bad human practices can at any time shift the classification of some of species down a path to extinction and particularly if the population is localised, leaving it extremely vulnerable to habitat destruction . Examples of animals that are in danger; the Bolivian Chinchilla Rat is Critically Endangered (CR), the Saipan Reed-warbler is Critically Endanged, the Stripenose Guitarfish is Critically Endangered (CR), the Brilliant Arboreal Alligator Lizard is Endangered (EN), the Chaco Side-necked Turtle is Endangered (EN), the Butterfly Splitfin is now Extinct in the Wild (EW), the Scimitar-horned Oryx is now Extinct in the Wild (EW) among these mentioned they are so many more other endangered species. 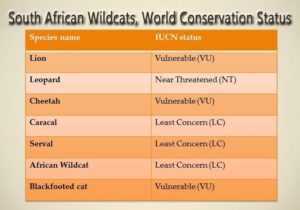 In South Africa, we have seven wild cats and it is interesting to see their conservation status. Create and support awareness campaigns to educate people about the importance of these species and why we need them. Never forget that as humans, we also rely on healthy ecosystems to survive.